Since making my way slowly into the art world in the last couple of years, I’ve started hearing about this magical sounding thing called an artist residency. 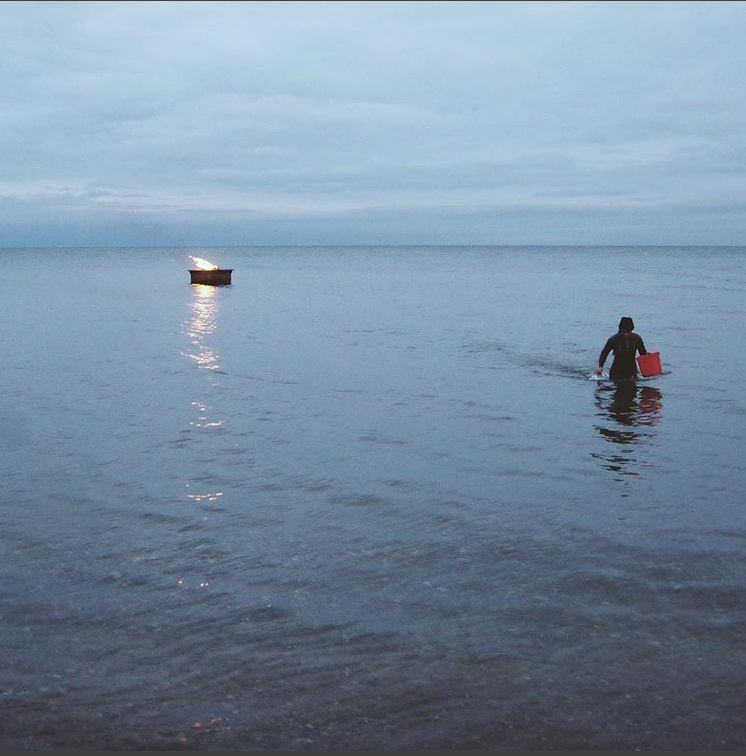 While they come in all sorts of different formats, the basic premise is that a residency allows you to go somewhere, outside of your regular life, to make art. I kept hearing about artists that had done this and it sounded like the best thing ever, so I started keeping an eye out for residencies that I could apply for. 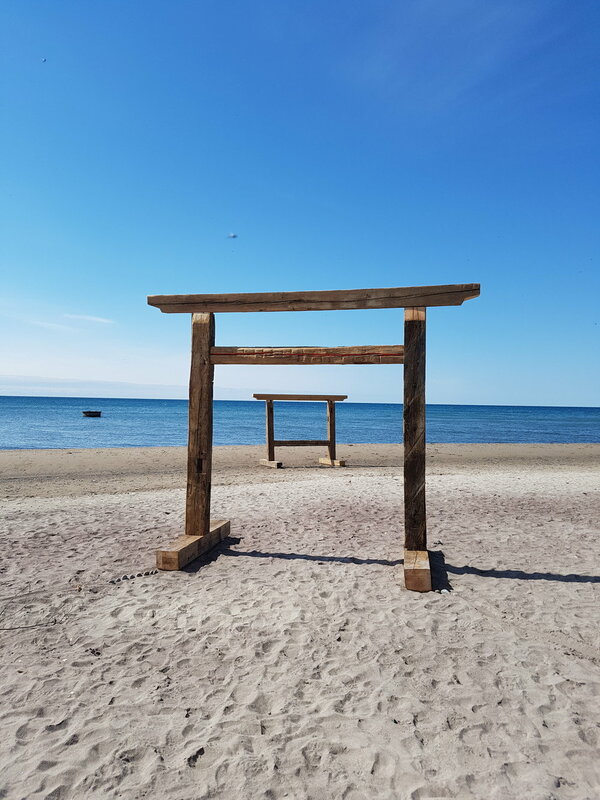 Last October, a friend posted on Instagram that she was having an amazing time at a place called Artscape Gibraltar Point. I looked it up, and found that they had all kinds of programmed residencies, where you pay a fee and go work on a specific project with a group and a facilitator. And one of the programs involved learning timber framing and collectively building a structure. One of my main goals this year was to learn more about building and materials so it seemed like the perfect opportunity. I applied and was super excited to be accepted. Then, as mid-April drew closer, I found myself getting more and more nervous. I had no idea what to expect. Would I fit in with the other artists? Would the residence be like summer camp for adults full of cliques and rejection? Would I be able to handle being around people that much or would I freeze up from anxiety and not talk to anyone ever? Thankfully it ended up being a lovely experience and I learned a lot - not only about timber framing, but also about myself. Now I’m hooked and I can’t wait for the next one. Before this residency I had limited experience working with wood. I had been making the bases for my sculptures - cutting, sanding, planing and staining them. But I didn’t know what it was like to work with wood in a more intimate way. It turns out, I love it. 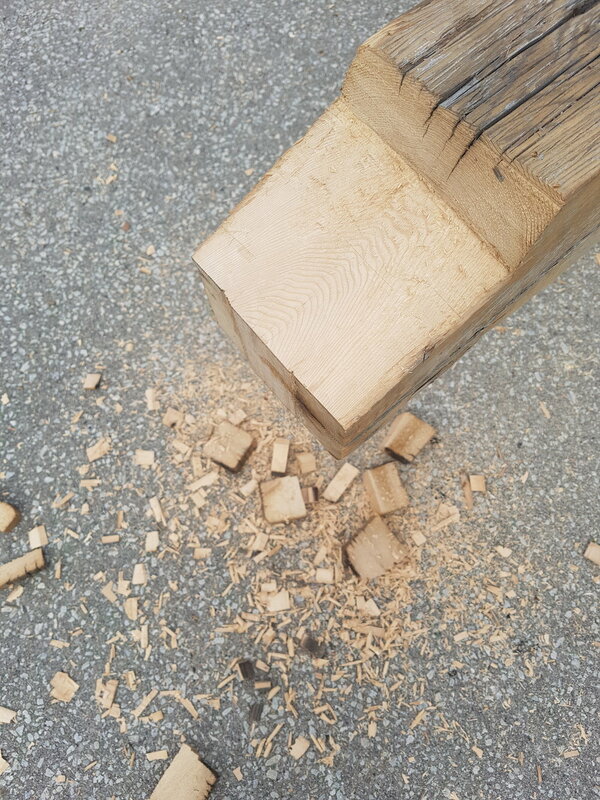 Over the course of the two weeks we learned to use a variety of tools and techniques, including a miter saw, a skill saw, a lovely little Japanese hand saw, a giant two-person hand saw, a drill, an auger, and - my favourite - a chisel and mallet. We learned measuring and scribing, and we learned that how the wood had grown and been processed and weathered and aged would affect how it would behave beneath our tools. We went to a wood dump (also known as the island tree graveyard) and watched a log being milled into thin sheets. 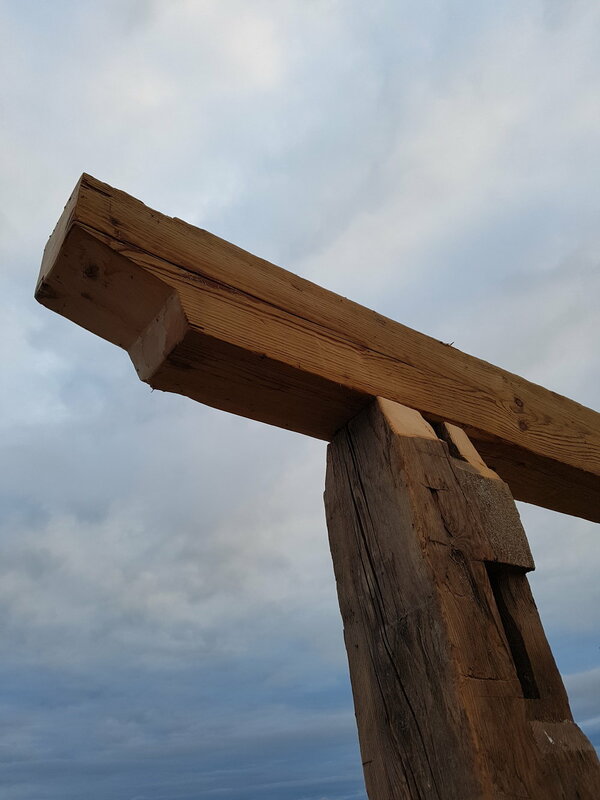 We attempted to make weathered barn timbers fit together. And we watched the wood fall to the ground in piles of dust, shavings, chunks, and heavy pieces. It was so incredibly satisfying. This is what I was most nervous about. I’ve often felt uncomfortable and awkward in communal settings but this time I was able to settle in and relax. In addition to the 8 members of our group, there were about 20 other people staying at the centre and we all ran into each other in the communal kitchen, chatting about our projects while we prepped meals side by side. This kitchen ended up becoming a focal point for the whole residency and my favourite space in the building. 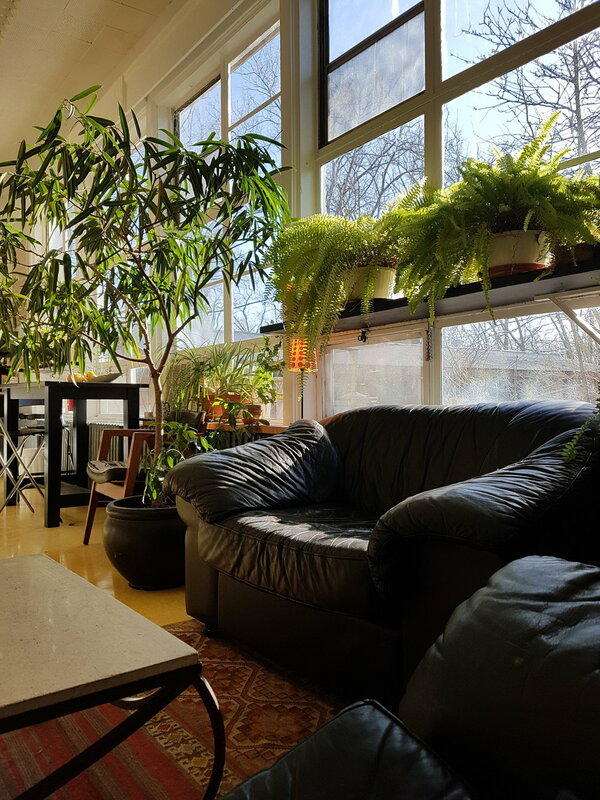 It was a large room with a wall of west facing windows and lots of plants. While I was waiting for meals I would curl up in a comfy armchair or sink into the couch with a book, half listening to conversations. When it was time to eat, we would gather around a long table in the centre of the room that sat 10-20 people lit by a chandelier made from salt crystals. Within our group we shared dinner and took turns cooking and contributing ingredients. It’s been a long time since I’ve regularly shared meals with more than one person so this was really nice. We spent hours sharing stories and laughing at inside jokes about trees and mushrooms. 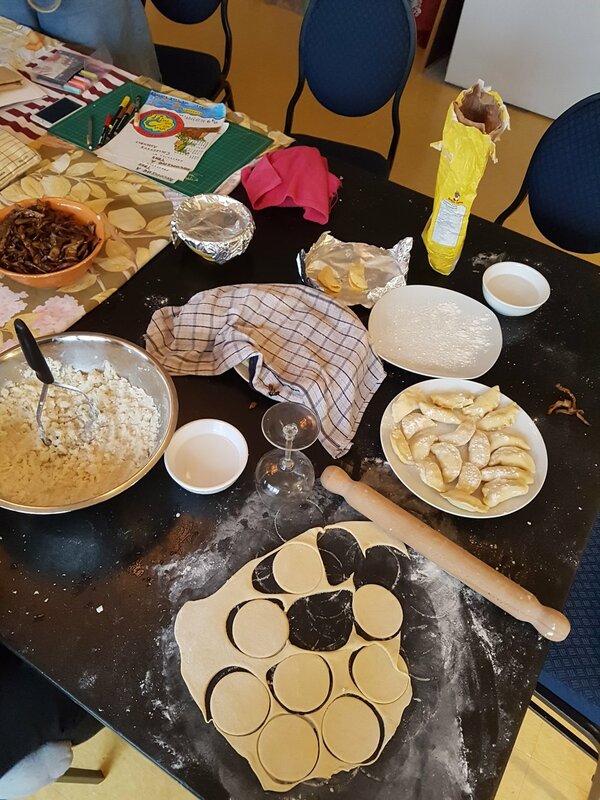 One night we spread out over the table prepping ingredients for a Ukrainian feast - peeling potatoes and apples and cutting onions, and the following night turned our prepped ingredients into pierogies and cabbage rolls. Most nights I went to bed feeling warm, connected, and content. At the end of our first week, a few people we’d gotten to know left and a new group arrived. I remembered how nice it had felt to be greeted in the hallways and kitchen on my first day so, when I saw a new person sitting at the table in the kitchen by herself, I overcame my usual reticence and said hello. We chatted very briefly and then I went on my way. At the end of that week, I ended up taking the ferry back to the mainland with her and her group and while we waited, she pulled me aside for a moment to tell me that me reaching out to her on her first day had meant a lot. She said I was the only person who had talked to her and it made her feel welcome and comforted in a strange new place. I almost cried. I’m not usually the type of person to reach out to strangers but now that I see the value of it, I want to be that person more often. When one of the members of our group told us she wanted to start a fire on a metal object sticking out of the lake, it seemed like a lot of trouble to go to for what I thought of as a “stunt”. But when she actually went and did it, I thought it was beautiful and was so glad I had stayed to watch. Sometimes we have these impulses to do strange things. And I often have the tendency to squash my impulses, especially when they’re outside of what I think of as normal or acceptable. But watching that fire blaze away surrounded by water reflecting the setting sun, I was grateful that she had followed her impulse and I felt inspired to do the same. While I was really enjoying spending my days working with wood, I somehow got hung up on this idea that I should also be working on a project of my own. Some of my fellow residency team members were making personal projects out of leftover wood and I felt like I should be doing something too. But I didn’t have any ideas. And at the end of the day I was usually too worn out physically and emotionally to give much thought to creating something. One day I was feeling particularly frustrated by this inner conflict so I set off to walk to the other end of the island - 40 minutes each way. The whole way there I was turning the “problem” over in my mind, wondering what I could work on, where the diverse inspirations and magic moments I’d experienced should lead me. I sat on the beach for a few minutes feeling stressed and tired and disappointed that my long walk hadn’t ‘resolved’ anything. On the way back I was passing someone’s front yard when I heard a rustling to my right. I looked down and saw a black and yellow garter snake winding through someone’s flower beds. I stopped to watch it and a man passing me paused to see what I was looking at. I pointed out the snake and he smiled and watched it with me for a moment. When the snake finally disappeared I felt like I had taken an emotional bath. I was cleansed of all my fretting and fussing and feeling shiny and new. In that moment I was completely absorbed and focused on the present. My worries were forgotten. And I was reminded that that is the most important work I can do: stay present. If I stay present, I will always find what I’m looking for. Getting comfortable with calling myself an artist has been a struggle. Since I didn't go to art school - and so many artists that I encounter did - I’ve always felt like there was a certain amount of legitimacy missing. I wholeheartedly believe that anyone can call themselves an artist if they approach the world with a sense of wonder and actively attempt to express it. But… I still wanted some kind of external validation that what I was doing ‘counted’ and that I truly did have a place in the art community. Exhibiting my work in small galleries helped, but there was always the nagging feeling that it wasn't the ‘right’ space. Getting the residency helped, but I also sort of felt like anyone could have done it. Finally this spring, I got what I was looking for. I applied for my first series of artist grants to help pay for the residency and one of my applications was successful. Finally, here was an official arts organization that was not only willing to recognize me as a professional artist, but to support my career with funding (many thanks to the Edmonton Arts Council for that support!). I couldn’t wait to put the new line on my CV. But then I realized something: the reason that this organization saw me as an artist was because I have been behaving like one for years. I have been making and exhibiting work, and seeking out opportunities to grow and learn. I’ve been doing the internal work required to see myself as an artist, to know that I belong just as much as anyone else. During the residency, we did an afternoon of show and tell, where we shared with our group what we’ve been exploring and working on. I was dreading it. I felt like what I was doing was silly compared to everyone else. But when it was my turn, the group made comments and asked questions that made me feel like the work I was doing mattered as much as anyone else’s. It was just as valid, just as interesting, and just as important. If I hadn’t decided on my own that I had something worth sharing, I never would have made the work that led me to apply for the residency, that helped me connect with artists and get that line on my CV. That decision was the most important thing, and it’s one that I have to keep making, every day.